You're most likely feeling powerless in some area of your life. You want something to change and you're not sure how to make it happen. I understand this and I have felt this way too. I want you to know you have the answers within you to whatever feels out of line in your life right now. If you feel unfulfilled, bored, or stuck in anyway, it’s actually the doorway to change. you have the ability to lead your life well and experience any answer you seek. You have the inner power - let me lead you there. Is this your year to courageously become and express your authentic self? ...this guide would teach you to identify, listen to, and trust your inner voice and let that wise voice lead you into the adventure and fulfillment that your life can, and should be. This life guide would be based in a set of practices that replace the ineffective habits you’ve adopted to date. It would teach how to lead your life well day in and day out. Live Your Inner Power is that guide. I struggled before I realized this tool could address any challenge I face. My clients are experiencing lasting results just as I have by learning how to live their inner power. We have a resource for life now. 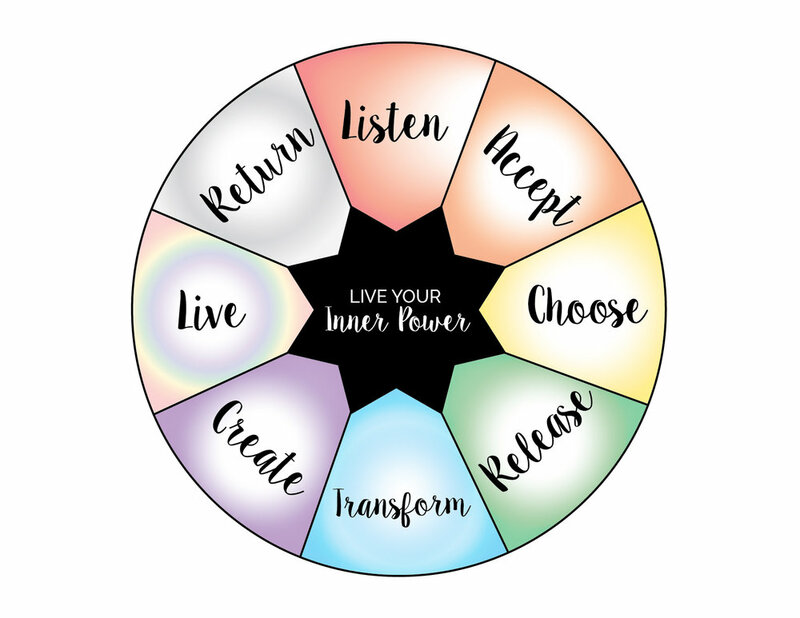 The Inner Power Wheel represents a set of eight practices that will transform and elevate your inner life in ways you can’t imagine right now. When you are feeling challenged by any life issue, you go to the wheel. With these eight practices as your habits, you create and live from an inner foundation of courage, authenticity and peace. And that’s your springboard toward your deepest desires. This program is all about creating a life based in your heart and soul’s desires. It transforms distress - stuck - bored - restless - anxious - into the path to fulfillment. It replaces the habits that got you into these places inside, and keeps you on track toward feeling both strong inside, and walking steadily toward the life you really want in your heart. What does the program actually look like? For 10 months you gather with a small, like-minded group of women to address an issue in your life that’s just not working. And you watch it transform. Each month you move through the content of an online module to learn and integrate one of the eight Inner Power Wheel practices into your daily life. You specifically use the practice to work with the challenging issue you identified in the first month. Journaling questions, guided meditations, video lessons and group coaching calls all help you develop each Inner Power Wheel practice into a habit, as you build that inner foundation of courage, authenticity and peace. You focus on one practice each month, because you need that time to really make the practice feel a part of your life, a new habit that replaces the habits that keep you feeling anxious, confused, stressed, scared and helpless. Slowly you watch yourself, and your group, transform and grow, blossom and heal, together. Group support and connection are the most favored aspects of this program by our graduates. Our powerful and transformational group process came from theories based in feminine empowerment and consciousness-raising. It’s magic that must be experienced first hand! This small group process creates safety, trust, and a deep and abiding belief that each woman has her own best answers within. She needs the right environment and support to find her way into those answers. Live Your Inner Power gives her that space and support. Is this your year for transformation? For learning a new way of being in the world that feels really good? Are you ready to leave excuses behind, get out of confusion, feeling stressed and blocked, move away from distractions and into your answers? Need some support to decide if this program is for you? Let’s get on a call for 30 minutes and flush out what you want to do.